Quality Sewer Cleaning Near Manchester MI - Associated Plumbing & Sewer Service, Inc.
Associated Plumbing & Sewer Service, Inc. Is Your Best Choice For Sewer Cleaning In Your Area! 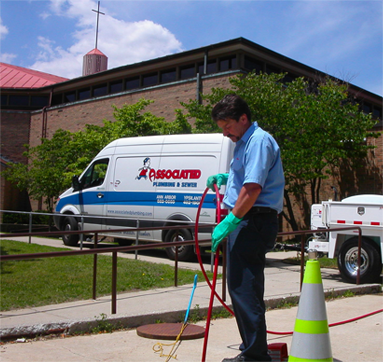 We employ some of the most experienced and skilled sewer cleaning specialists near Manchester MI. To address drain and sewer problems, rely on a plumber you trust. Hiring unqualified companies to examine and service your drain can cause long-term damage. At Associated Plumbing & Sewer Service, Inc., our drain cleaners have over 50 years of sewer and drain service experience. Trust our friendly and experienced staff of sewer and drain technicians to quickly get to the bottom of your drain problems. Associated Plumbing & Sewer Service, Inc. has diagnostic experience to evaluate the problem and pinpoint the cause. We put a drain line camera down your pipes and show you the problem. By gaining an understanding of the issue and creating a solution, we can save you time and money. We'll never upsell our services and are committed to being your go-to sewer and drain specialists. If you have a obstruction or tree root problem, we have the equipment and anti-root bacterial solutions to resolve the issue. Your drains are the closest link between you and your plumbing system - whether they're in the sink, the floor, toilet or bathroom. A problem with your drain may be a sign of more extensive plumbing damage, and even if it isn't, fixing the drain quickly is key to preventing more extensive problems. Associated Plumbing & Sewer Service, Inc. offers comprehensive drain cleaning for homeowners throughout Manchester. In-Depth Inspections - The first step to solving a problem is to figure out what's causing it. We use camera line inspection to assess most drain issues. The resulting video will give us a clear idea of what is wrong with your drain. A broken or clogged drain is often the first sign of more comprehensive problems with your plumbing system. Depending on the symptoms, the issue may extend all the way to the sewer line. We rely on your input to determine the source and severity of what is ailing your drain. We advise you to notice how the different drains throughout your house interact with each other. As is often the case in plumbing, the sooner your catch a clogged drain, the easier, cheaper, and cleaner the solution. No matter the conditions, we will be happy to visit your house, assess the issue, and develop a solution. When it comes to drain and sewer problems, act quickly. Trust the reliable and experienced team of technicians at Associated Plumbing & Sewer Service, Inc. to clean your drains! Contact us today to learn more.